Software Testing is defined as the process of testing the software product to make it defect-free under business requirements and the output results should match with the customer’s expected results. 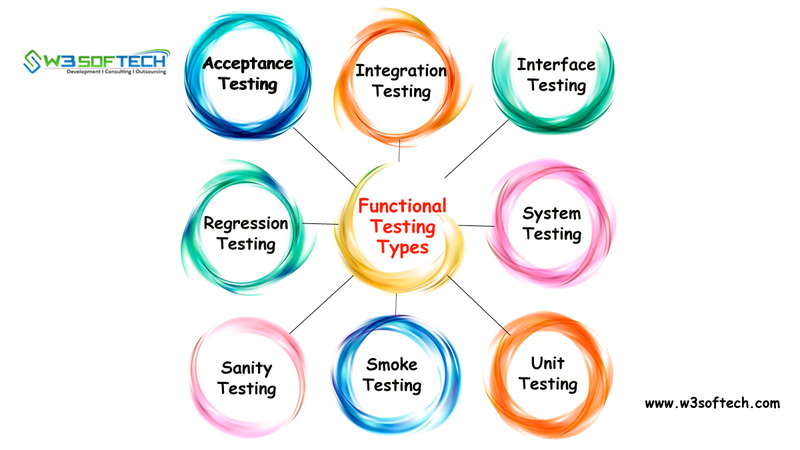 Here in this blog, you can find Functional Testing Types and their usage in software testing. Functional Testing is one of the types of software testing which can be defined as the each and every individual function of a software application needs to be operating with required specification. The major role of Functional Testing is to perform individual functions for a software application with respect to the requirements and specifications. Simply we can say that functions of a system need to be tested by given input and the output results should match with the expected results. An acceptance testing is used to perform by the client and checks whether the total workflow of the software application is as per the business requirements and satisfies the customer’s expectations. The software application will be accepted by the client only when all the functions of system work as expected. It is also called as User Acceptance Testing (UAT). As the name itself says it is the last phase of testing later the software goes into production. Beta Testing is used to perform in a real-time environment for actual end users before releasing the product into the market. The major aim of it is to check whether there are any failures in the product or not. It must satisfy the business requirements along with customer’s expectations. Beta Testing is usually done by the end users before releasing the product into the worldwide market. It is said to be successful only when the customer accepts the software. Integration Testing is one of the types of functional testing. It is used to perform testing on all integrated modules and checks whether they are working fine when integrated as worked as individually. In other words, we can say that it is used to test the interfaces between modules. Interface Testing is also one of the types of functional testing. It is ensured to verify whether the communication between two different software applications is done rightly or not. Mainly it is done in two main segments such as Web server and application server and application server and database server. The main purpose of it is to ensure that the actual end user should not face any failure while using the software product. Regression Testing means re-testing the software product. After applies the code changes which does not disturb or impact the previous functionality of the product. Usually ensures to verify the functionality of the software product after the modification has been done to the product. System Testing is defined as testing the whole system including all the modules which are integrated as per the business requirements. It also comes under the black box testing technique. It must be done after integration testing and plays a major role in providing a high-quality product. However, it is difficult to perform testing on the whole system so mainly uses some of the automation testing tools. Sanity Testing can be defined as if a software application is facing the crashing issues at the initial stage of usage and may not be useful for further testing then there is a need of building an application to fix it. It also comes under one of the functional testing types. It can be done depending on the implementation and its impact. It is the first phase of testing that should be done on any new build application. Smoke Testing is a type of software testing used to perform the group of tests. It ensures to check whether basic functions of the software application are working correctly as per the business requirements. Unit Testing can be defined as testing of an individual software module or component. It is quite opposite to the smoke testing. It is usually done by the programmer as the method of writing code to verify the written code in implementing business requirements.